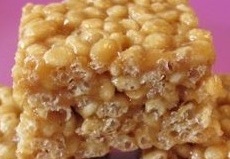 I posted a while ago about Trader Joe's pre-made rice crispy treats, but since rice crispy bars are so easy to make, I wanted to share a nice recipe for a homemade version made with peanut butter instead of marshmallows. Rice crispy treats are a satisfying dessert or snack because they are so crunchy and chewy and fun to eat. I to make them with brown rice syrup instead of marshmallow because rice syrup is a low-glycemic sweetener, which means it does not cause a big blood sugar spike. For me, this means I stay full much longer. Though peanut butter tends to be high calorie, the quantity per portion in this recipe ends up small. All in all, probably a bit better for you than marshmallows. And, the brown rice syrup in this recipe makes the bars more than sweet enough. So far I have made them twice, once with low calorie peanut butter and once with PB2, both of which I recommend you try! In a saucepan heat the first 3 ingredients until they are well mixed and smooth. Add cinnamon and stir well. Pour the dry cereal into a large mixing bowl and add the rice syrup / peanut butter mixture. Mix well until all the rice crispies are well coated. Press mixture into an oiled pan and flatten with a spatula. Cool to room temperature and serve. Makes about 12 bars. Each bar is 112 calories and 3 weight watchers points plus points (do re-check your calories/points based on what peanut butter you use). Hi Juliet. Do you add water to the PB2 first or do you use 1c of the powder? Thanks. Yes, follow the directions on the PB2 to make one full cup of peanut butter. I hope you like the recipe!